Estate Planning is the process of creating documents that legally determine how your assets will be distributed after your death, including who inherits, who controls the distribution of assets, and what tax considerations must be incorporated into these documents. What Do I Need to Consider if I am Going to Have a Will Drafted? First, you should consider if you would also like a Living Will and a Power of Attorney as well. If you have minor children you should decide on at least one set of guardians and whether you would like a trust to provide for them. Think about whom you would like to administer your estate and whether there are specific personal items, property or gifts you would like to leave to family or friends. You also need to consider how you would like your monetary assets distributed. Part of that can be how to structure your estate so there are fewer taxes. 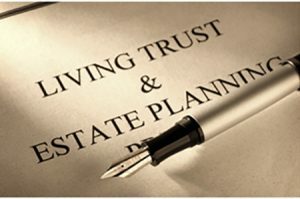 A trust is a legal agreement where you (the “Grantor”) transfer your assets to a trustee who holds title to the assets on behalf of a beneficiary. A trust may be either revocable or irrevocable during your lifetime. Trusts are not probated and sometimes allow you to avoid the need for probate. A beneficiary is whomever you want to benefit from the assets held in trust. A beneficiary can be you, your spouse, your children, or other friends or family who you designate.